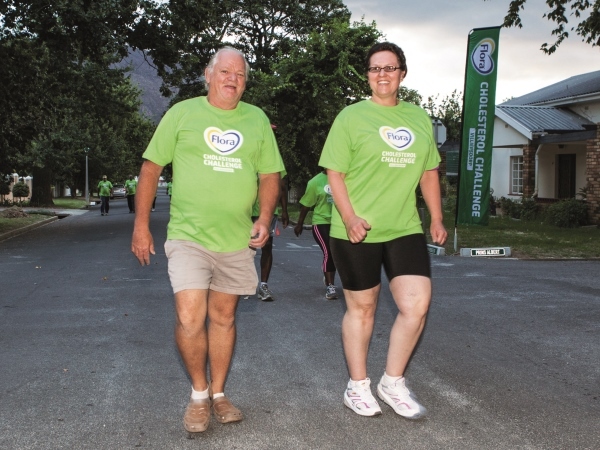 The people of Villiersdorp have accepted a challenge – to lower their cholesterol with a 21-day walking and running programme. Villiersdorp residents Douw and Susan Steyn enjoying a fun walk. Keeping fit and getting daily exercise is crucial to maintaining a heart-healthy lifestyle. With Flora’s 21-day Cholesterol Challenge the residents of Villiersdorp in the Western Cape were introduced to nutritional as well as fitness activities aimed at lowering their cholesterol. 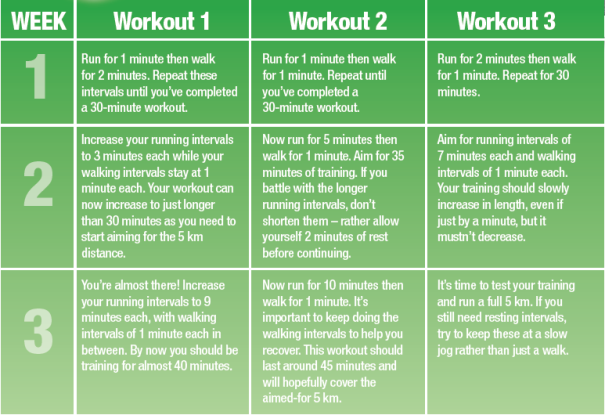 The fitness objective – to get fit enough in three weeks to be able to walk and run 5 km – was achieved through an easy, manageable plan developed for all fitness levels. She says when committing yourself to a fitness routine it’s important to stick to it to ensure manageable, reliable progress. “By simply increasing your intervals of running and decreasing those of walking, you’ll soon train your body to manage a 5 km run with ease and enjoy the health and aesthetic benefits that come with it,” she says. The fitness guide (below), developed by Lisa, alternates intervals of walking and running and is aimed at lowering your cholesterol. For optimum results, also eat 25 g Flora pro.activ a day for 21 days to lower your cholesterol by 15 per cent. Train at least three times a week. Here are three workouts. Simply repeat No 2 and No 3 if you wish to train more. Always train for 30-45 minutes. This is an adequate workout for a beginner. Your training times will remain the same, even when you progress to more running than walking. As you improve your training times will increase from 30 to 45 minutes, but try to restrict any more variation. The intensity of your workout will increase with your fitness level, keeping your training challenging even though it’s done in the same time. Stick to your training schedule. You might be tempted to exceed the guidelines each week but resist doing this, as the escalating intensity might become difficult to maintain. Enjoy achieving and maintaining your weekly goal and look forward to the challenge the following week will bring.